I mean, just look at this blessed thing. Don’t you just want to eat that? This season, I’m hooked on Yuri on Ice, an anime about a couple of figure skaters finding new inspiration in their sport. One of my favourite manga artists, Kubo Mitsurou, wrote the screenplay for this show with the help of professional figure skater Miyamoto Kenji. So far, the story’s hilarious, the scenery of Hasetsu (Karatsu in real life) is beautiful, and the skating scenes are magical. 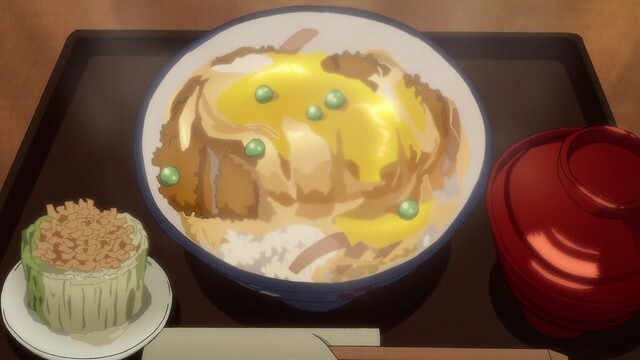 Then last night, with the newest episode, this bowl of katsudon was the best yet. As a lover of delicious fictional food, I knew I had to make it! So today, I decided to celebrate a personal victory by making this Victorious Katsudon from Yuri on Ice! 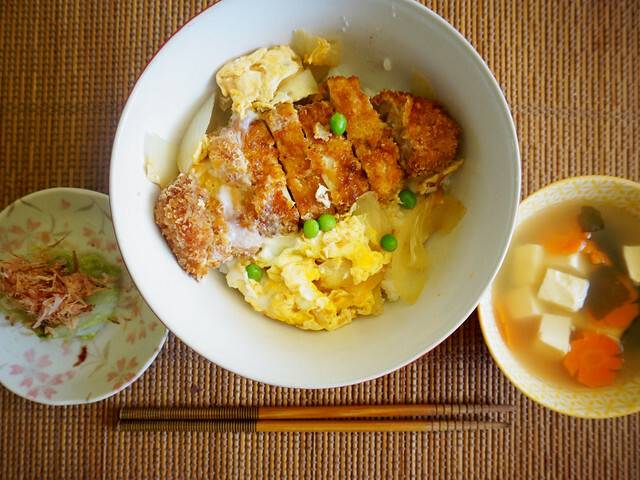 This katsudon set meal has three components: 1) the hakusai asazuke (Pickled Napa/Chinese Cabbage), 2) soup — possibly miso, and 3) the extra large katsudon. Making this dish is a bit tricky but with enough organisation, you can easily make this at home and possibly within an hour! Asazuke’s one of the staples in a Japanese home. It’s usually a vegetable, like cucumbers or Napa cabbage, lightly pickled in salt and some flavouring. The best ones are pickled for hours and with the finest ingredients. These are luxuries we certainly do not have so here’s a little cheat I learned from my Japanese mums in making asazuke on the fly. Peel the leaves from the cabbage, rinse it under cold water, and dry it with a towel. Mix the dashi and salt to make dashi salt. Pinch some of the dashi salt and sprinkle it on the leaves. 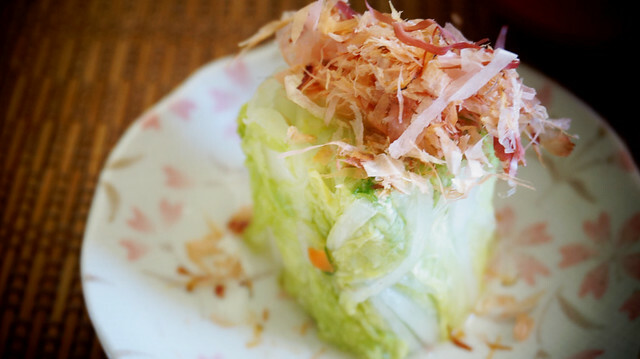 Make sure to sprinkle more on the base of the cabbage than on the leaves. Put the leaves inside a ziplock bag and toss/rub it for a bit to evenly spread the dashi salt in the leaves. When finished, take as much air out of the bag and zip it close. Place the zip lock bag under a heavy book and leave it there for 30 minutes to an hour. You can start making the soup and the katsudon at this point. When you’re done preparing most of the things (except frying the katsudon), take the zip lock bag and take out the leaves. You know the leaves are ready when there’s water in the ziplock, and you can bend the base of the cabbage without breaking. If it breaks, then don’t worry about it. Roll the leaves tight like it’s sushi. Make sure to squeeze as much as you can while you roll to take out excess water from the leaves. You know you’re done when the leaves form a cylinder. Cut the cylinder into 2-inch sized cylinders and serve with a shaved katsuobushi on top. Squeeze as much water out of the leaves. Cut it into bite-sized pieces and eat! 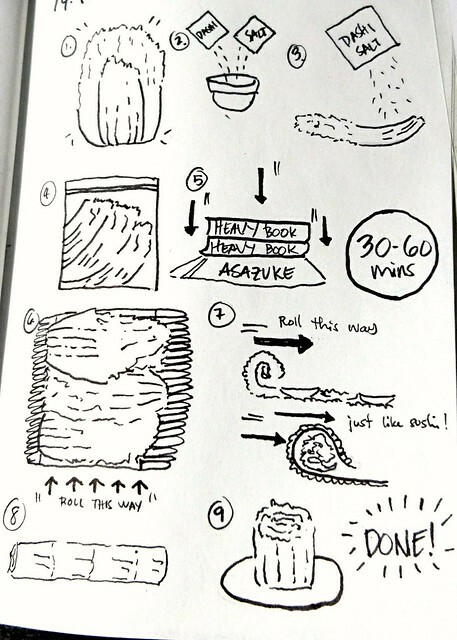 For your reference, you can also check out this diagram I drew to give you an idea on how to prepare this asazuke!! You can take the easy route and just make whatever soup you like. You can even use instant miso soup and add hot water. 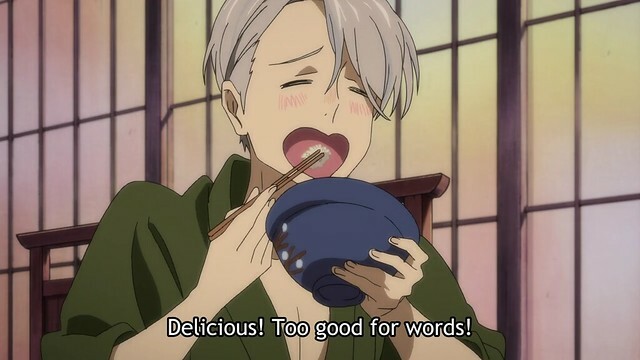 But if you can make your own soup, it’ll make your katsudon worthy of Viktor’s Victorious smile! Once boiling, add the dashi stock and a small pinch of salt to taste. When the stock boils, take out 1/2 cup of the stock and set aside. You will use this stock for the katsudon. Add all the vegetables and tofu and bring back to a boil. Take it off the heat and stir the miso paste if you want. 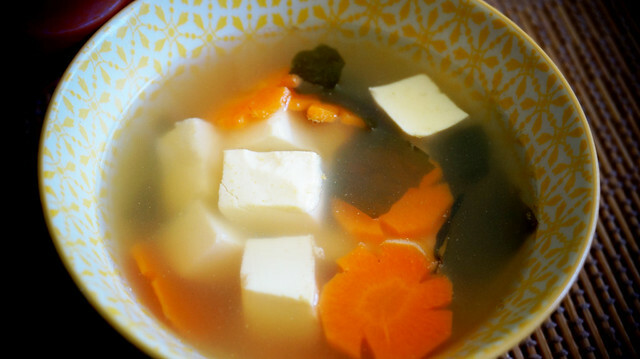 This soup was made with shirodashi, a kind of soup stock that’s blended with white soy sauce. If you can find this, it’s perfect for clear dashi stocks! If not, a regular one will do. Heck, if you have instant mushroom soup, that should be fine too! A Katsudon too good for words! Finally, the last step! You can make this the easy way by buying cooked rice or microwaveable rice. It doesn’t matter! What does matter is the pork and the yummy eggy katsudon sauce! Season the pork with salt and pepper. If you want richer umami flavour, skip the salt and use fish sauce instead. It adds the saltiness you need if you brine it for 10-20 minutes. In a frying pan, put some oil until it fills at last half an inch. This is usually between half a cup or a cup. Heat the oil up on medium-heat. Beat the egg in a shallow dish where you can dip the pork loin for frying. On a plate, place the panko. Coat the pork with flour then dip it in the egg. Once the pork is coated with the egg, coat it with the panko on a plate. Check if the oil for frying is hot by dipping a wooden chopstick, and you can see bubbles quickly rise from its side. Place the breaded pork in the oil and fry it on each side until it’s golden brown. This should be 3 minutes on each side. If you think your pork is getting burned too fast, lower the heat just a bit. When both sides are golden brown, set it aside to rest while you prepare the katsudon sauce. In a donburi/serving bowl, place your piping hot rice. Get a small fry pan and pour the group A ingredients. Cook it over a medium-high heat and wait for it to boil. Add the onion and the peas to the sauce and cover the pan for 2-3 minutes, at least until the onion is kinda soft. Place the katsudon in the stock and pour the beaten egg on top of the katsudon. Take it off the heat and cover for 15-30 seconds or at least until the eggs look cooked. Slide the tonkatsu and the sauce on top of the rice. 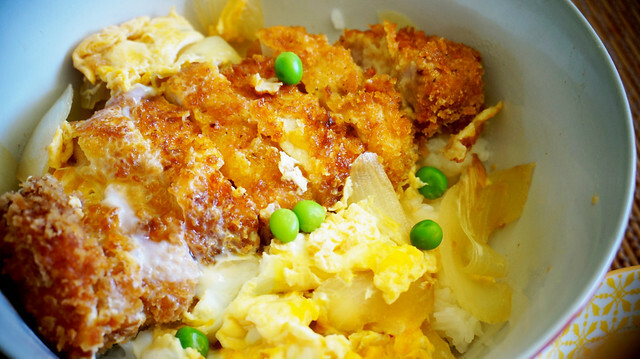 Enjoy your katsudon like a world-class figure skater! If you have the leftover egg from frying the tonkatsu, add it with this beaten egg. Not gonna lie, katsudon's best when it has more eggs! Recreating this dish is a bit hard, but the reward is this lovely delicious meal that makes you feel like you won something in life. 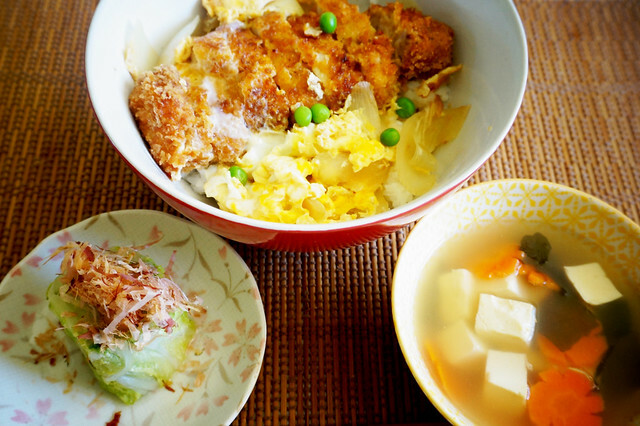 After all, katsudon has that special cultural meaning in Japan. 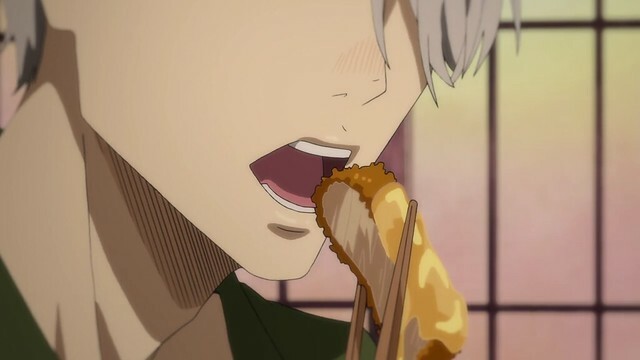 The “katsu” in katsudon could be read as “victory” hence people eat it as their reward for having won something! Katsudon is also special for criminals but we’ll stick to the victory meal for now. You can watch Yuri on Ice in Australia via Crunchyroll!